A partnership of the town, state and federal government made possible the acquisition in 2008 of the largest remaining unprotected property within the boundaries of the Waquoit Bay National Estuarine Research Reserve. The 11.7-acre property could have been subdivided into four estate lots on Bournes Pond and Calebs Pond. Instead, the state Department of Conservation and Recreation purchased the land from the Grinnell family to give added protection to Waquoit Bay. The property is used for research by WBNERR rather than public access. 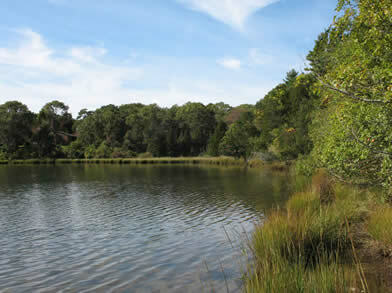 The Grinnell property abuts 11 acres of private property that are protected under a conservation restriction, and that property links to WBNERR’s headquarters at the head of Waquoit Bay. Combined, they create an area of more than 40 acres of preserved land. The National Oceanic Atmospheric Administration, which is the parent agency of the national estuarine research reserve system, contributed the lion’s share, $985,000, to the $1.8 million purchase. The state Department of Conservation and Recreation contributed $415,000, and $400,000 as a local match came from the town Community Preservation Act funds. The state owns the property. It is managed by WBNERR.